Annai J.K.K. 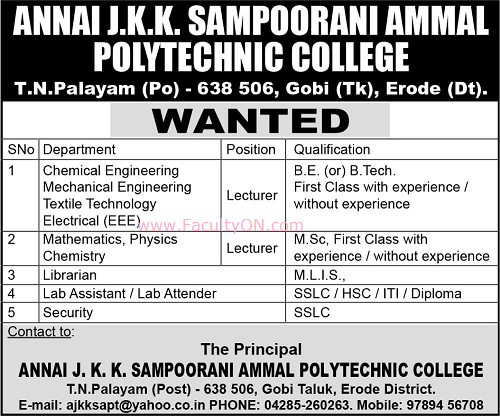 Sampoorani Ammal Polytechnic College, Erode has advertised for recruitment of Lecturers / Non-Faculty jobs vacancies. Interested and eligible job aspirants are requested to apply as soon as possible from 7th December 2018. Check out further more details below. About College : Dr. J.K.K.Munirajahh, a leading Industrialist of Komarpalayam town, Namakkal Dt, Tamilnadu, India is the Chairman and Managing Trustee of Annai J.K.K.Sampoorani Ammal Charitable Trust. He had his Post Graduate Studies in "Textile Management" renouned Bolton Institute of Technology, Bolton, United Kingtom. He is the Managing Director of Two Textile Spinning Mills, one at Komarapalayam, and another at Tiruchengode. He has forty years of experience in administering Industrial establishments. He founded Annai J.K.K.Sampoorani Ammal Charitable Trust in memory of his beloved Mother in 1971 for the purpose of providing health care and Education to the public at large.He founded under the auspices of the trust,a hundred bedded hospital and also Paramedical Institutions offering courses both degree and diploma in faculties of nursing pharmacy and physiotherapy at Komarapalayam Namakal Dt,Tamilnadu,India.Besides a polytechnic and I.T.I were also established at T.N.Palayam,Gobi Taluk,Erode Dt,Tamilnadu,India in Vast area of nearly 200 acres of land.Schemes like Community Polytechnic,TRYSEM,NORAD etc of both Central and State Government are being Implemented by Trust. How to Apply: Interested and eligible candidates are required to send CV, copies of certificates along with recent PP size photo the email address or postal address mentioned below.